James William Humphreys Scotland flew a Caudron biplane from Invercargill to Gore, completing the first cross-country flight in New Zealand. From Gore, he made his way north, stopping at Dunedin, Timaru and Christchurch. 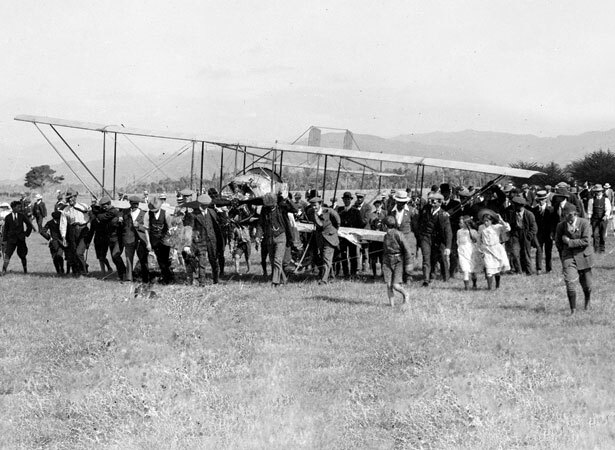 His flight came to an uncomfortable end on 25 March when he crash-landed on Wellington’s Newtown Park. Kaipara-born Scotland was educated in England, where he gained his pilot’s certificate – the second New Zealander to do so, after Aucklander J.J. Hammond. Returning to New Zealand, he joined New Zealand Aviation Ltd and gave aerial exhibitions in various centres. Early in 1914, in an attempt to popularise aviation and promote commercial opportunities, the company arranged for Scotland to make a series of cross-country flights from Invercargill northwards, putting on flying displays at stops along the way. On 7 March 4000 people watched his exhibition over Christchurch’s Addington showgrounds. We have 10 biographies, 1 article, related to Scotland crosses Southland in pioneering flight.